Bar-Ilan University’s campus is easy to get lost in. As follows is some information to help you find your way, including gate and shuttle times, on- and off-campus parking, and important offices you’ll likely need to visit. To see a map of the entire campus, click here. With all the hundreds of offices and buildings at Bar-Ilan University, there are several offices that BIU students – especially Olim Chadashim – will need to visit on more than one occasion. Shabbat: 15 minutes before candlelighting, 8:00-12:00, 1.5 hours before Shabbat ends. Pedestrians may exit from all gates at all times. All gates are closed to automobiles on Shabbat. 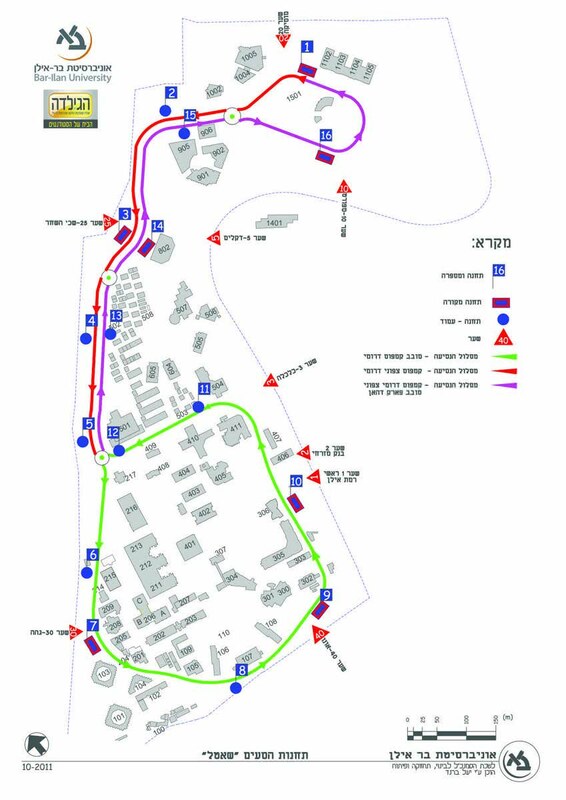 Bar-Ilan University offers an internal shuttle service to get you from one side of campus to the other quickly and free of charge. Click here for full map. As of 2018, Bar-Ilan's campus is littered with bright yellow bicycles, which may be rented by anyone. Download the OFO app (Google Play | AppStore). Type in the Bike Number into the app. Input the code into the lock (Note: you must put them in from right to left!) and press to unlock. Despite popular opinion, you are required to return the bikes to one of the 15 bike stands located throughout campus. In order to enter Bar-Ilan University, cars must be approved and registered with Bar-Ilan Campus Security. Whereas as a year-long entrance pass is near-impossible to obtain, students living in the dorms (and in extreme circumstances, overseas students) can get a one-time pass by calling the Dormitory Office or the Dean of Students Office. The Student Union offers a limited amount of Motorcycle Parking Passes for campus, on a first-come, first-served basis. This costs approximately 100 NIS for non-Agudah members, per year. To receive a Motorcycle Parking Pass, you need to visit the IPI Office (near Bldg. 902 | 03-5253367), and fill out the requisite form. There are several parking lots used primarily for BIU students, next to the various campus gates. Parking in these lots is for a fee. Agudah members, are eligible for a parking discount, which they must visit the IPI Office to receive. Located on Max v’Anna Webb Street (near Bldg. 605), is the Economics Gate Parking Lot, which charges an hourly rate. Cost (Non-Agudah Member): 4 NIS (first hour) + 1 NIS (every additional hour); 20NIS per full day. Cost (Agudah Member): 2.5 NIS (first hour) + 0.5 NIS (every additional hour); 9NIS per full day. These parking lots, located next to the respective campus gates, charge a flat fee per entry. Cost (Agudah Member): 9 NIS.